Dudes – once again I am humbled by your fabulous comments! I for sure thought this one was going to go semi in the undercurrent of the knits out there since there are so many TYs for you to see but Yowzers thank you! I highly recommend the pattern and love the yarn – Rowan Felted Tweed. However, did anyone else notice how easy it was to break the yarn? I mean maybe my superhuman strength was more than enough for it’s simple ply but for reals it broke so easily! Anyway I’m obviously glued to the computer lately – every time I post I always obsess over it. Refreshing my emails and blog site. I also cannot stop refreshing my Notebook page in Ravelry to see if the little numbers beside the hearts change. I love getting more hearts the way I love getting comments, tee hee! AND speaking of comments we have broken the 1,000 comment milestone here at Tentenknits!!! Congratulations Kate from Purlygirly you are my 1,000 commenter!! Bob, tell her what she’s won..
At the moment my boyfriend and I have just finished watching the latest episode of Heroes. I won’t give anything away but geeze can we get something going – I feel like all the episodes so far have just been "set-up" shows and not results – don’t turn into Lost!! Please, talk about the biggest let down from Season 1. Let me not even start on TV shows – let me show you what I was doing while watching… continuing the progress on my Koolhaas. The little something on the side before I start yet another sweater. Knitting sweaters makes knitting hats seem like knitting in light speed. Nothing makes Monday more tolerable than Malabrigo. Well my friend, you deserve all of those comments and hearts! You continue to create gorgeous knits. That is going to be one yummy Koolhaas in Malabrigo! Koolhaas is so next on my list, I love it! I agree with you about Heroes- and sometimes it feels like they are just tossing in a few odd scenes just for the sake of it. That’s some yummy looking Malabrigo you’re using for your hat! I really love your taste in knits. I’m glad to see you’re trying this pattern in Malabrigo. It’s definitely on my list to knit and I was wondering how it would turn out with that yarn. Can’t wait to see! Your tangled yoke was gorgeous too! 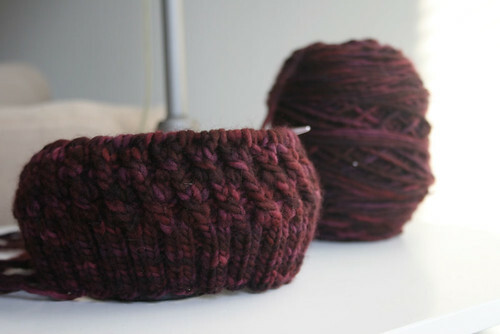 I have yarn ordered for the tangled yoke – seeing your lovely finished sweater makes me so impatient to start mine! P.S. Heroes lost me a while back, have you tried Pushing Daisies? It’s my new favorite show. Your TY is gorgeous. I totally agree with heroes this season – it’s so meh.